Transportation Co., Inc. (BTC) – celebrates its 100th year in business. Maritime Reporter looks at BTC’s evolution through the years. 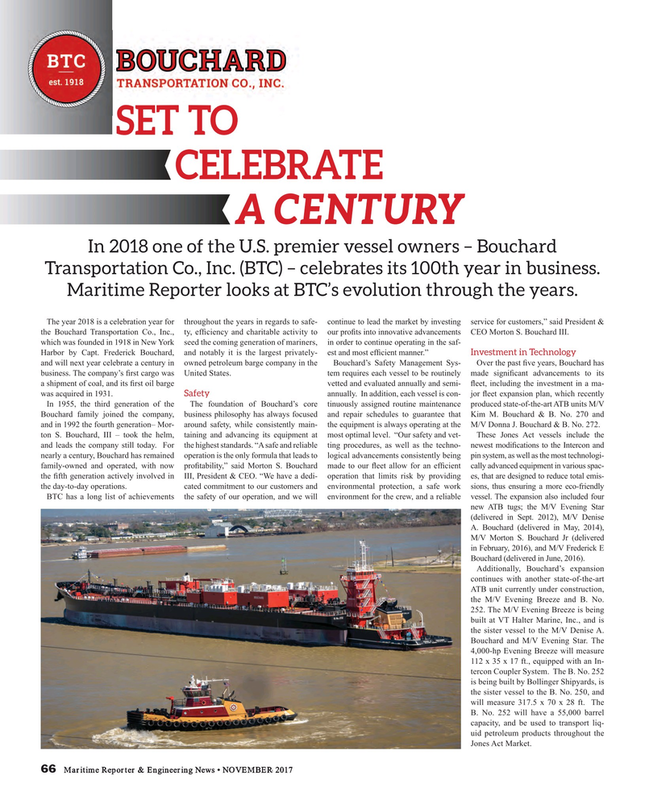 The year 2018 is a celebration year for throughout the years in regards to safe- continue to lead the market by investing service for customers,” said President & the Bouchard Transportation Co., Inc., ty, ef? ciency and charitable activity to our pro? ts into innovative advancements CEO Morton S. Bouchard III. Bouchard (delivered in June, 2016). ATB unit currently under construction, the M/V Evening Breeze and B. No. 252. The M/V Evening Breeze is being built at VT Halter Marine, Inc., and is the sister vessel to the M/V Denise A.